The Fang Trigger for the 98 is the best you can buy! Now the FANG trigger for the 98 comes with dual roller bearings! The FANG Trigger is the highest quality billet aluminum, best feeling trigger available for Tippmann 98's, 98 Customs, and the new 98 Custom Pro E's. Why use a junky plastic trigger when we made you such a nice one? 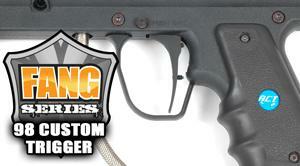 The trigger has been designed to work on all models of Tippmann 98's from the old to the new.